For the past three weeks we have been involved in one of the most amazing projects in our long career as art gilders. Through talented artist, Joanna Buckley, who was inspired to cover the Abbotsford Convent in Dutch Gold Leaf, we worked to cover the facade of the building. The cover will last for approximately two years and is part of a semi-permanent exhibition. The project has been extensively covered in the media including The Age. Click here for a full gallery of images of the project. ‘The Light and the Ground’ will investigate an immersive sensation of colour and light, and whether this has an effect on heightening the experience of awareness in the space. The work will aim to reference processes of transformation, symbolically, and perhaps also in its lived experience. The gold façade will form a background to the daily experiences that take place at the Convent – children playing in a tree, passers-by, a worn fire hydrant, sunset – each new composition revealing simple but striking relationships and perspectives. The intention is for it to be a subtle transformation of space that supports the community and its activities. 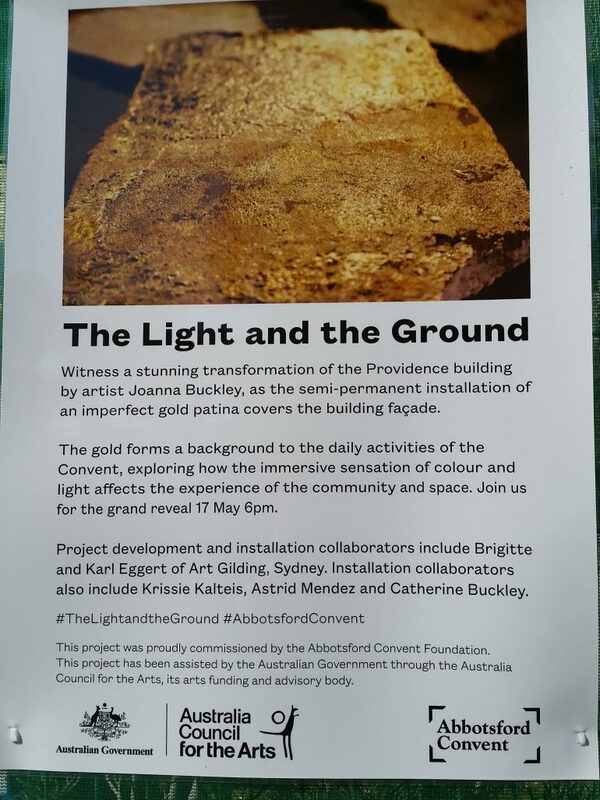 Gold’s associations with light, awareness and transformation are significant to the memory of the Abbotsford Convent site, and through this new creative development, are hoped to inspire a transformed awareness of the presently unfolding community and space. Joanna Buckley’s practice involves sculpture and site-speciﬁc installation with an interconnected relationship to nature and abstraction. She has exhibited at Lorne Sculpture Biennale, Artery Co-operative Studio Exhibition, Incinerator Gallery Environmental Art Exhibition, the Museum of Chinese Australian History, ECNU Shanghai World Expo 2010, Moonee Valley City Council Arts Week, artist and community run spaces, and produced work for various commissions. Buckley studied Design at QUT, Brisbane, culminating with a semester in Milan, travels through Europe and eight months design employment in York, England. In 2009 Joanna moved to Melbourne where she completed RMIT’s Master of Arts (Art in Public Space), graduating in 2011. Joanna Buckley is currently an associate of Fine Art Studio and studio artist at Artery Co-operative Ltd in Melbourne. Project design development and installation collaborators include Brigitte and Karl Eggert of Art Gilding, Sydney; Krissie Kalteis, Astrid Mendez and Catherine Buckley. This project was proudly commissioned by the Abbotsford Convent Foundation.